MUNICIPAL STADIUM (Hagerstown, MD) - It was a pure rubber match between the Lexington Legends and Hagerstown Suns in the series finale. Tied after nine innings, the Suns walked it off with a 2-1 victory over the Legends. Lexington now falls to 20-17 in the second half of the season and remain 0.5 games out of first place in the Southern Division behind the Greenville Drive. Both starters held opposing teams scoreless until the seventh inning. 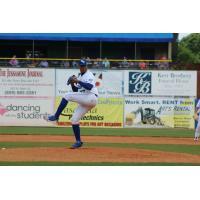 Lexington's starter Carlos Hernandez hurled 7.0 innings allowing one run on four hits while striking out six. Andrew Lee for the Suns pitched 6.0 shutout innings allowing three hits while walking one and striking out 12. After six shutout innings, both teams plated their first runs of the game in the seventh. In the top of the inning, Cristian Perez was hit by a pitch, then back-to-back singles by Manny Olloque and Carlos Diaz loaded the bases. William Hancock then popped up a sacrifice fly to right field bringing home Perez, and the Legends led 1-0. In the bottom of the seventh, Jake Scudder led off with a home run to right centerfield and the game was tied 1-1. After the Legends were unable to get a run across in the top of the tenth inning, the Suns walked it off in the bottom of the inning. Omar Meregildo began the inning on second base as the Pace of Play Runner. Phil Caulfield moved him to third on a sacrifice bunt. Alejandro Flores then brought Meregildo home when he hit a groundball to the second baseman, Ricky Aracena. The baseball bounced off of Aracena's glove, allowing Meregildo to score and the Suns won 2-1. Colin Snider was given the loss for the Legends, tossing 0.1 hitless inning allowing one run (unearned). Frankie Bartow was awarded the win for the Suns throwing 2.0 shutout innings allowing one hit. The Legends now travel to face the Lakewood Blueclaws in a four-game series beginning tomorrow, August 2 at 7:05 p.m. Both pitchers are TBD.